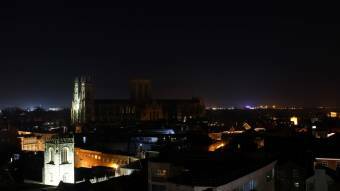 York Minster Cathedral - A splendid HD view from the Park Inn by Radisson, York. York: River Ouse at York, 0.2 mi. Leeds: Millenium Square, 21.8 mi. Leeds: Park Plaza Leeds, 21.9 mi. Hull: Boothferry Park Weather Cam, 32 mi. Burnsall: River Wharfe at Burnsall, 35.7 mi. Filey: Filey Beach and Filey Brigg, 36.7 mi. Piercebridge: River Tees at Piercebridge, 46.3 mi. Hawes: Market Place Hawes, 51 mi. This webcam York with the theme Churches was added on August 10, 2018 and is operated by Carlson Rezidor. It got 1307 visitors since then. Shouldn't this webcam work or should the link be wrong please report that here. You can add this webcam here to myCams. Here we have a list of places in United Kingdom with webcams nearby.